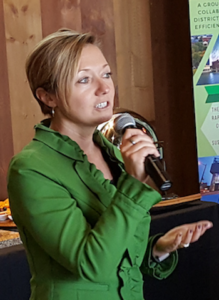 Grand Rapids Mayor Rosalynn Bliss recently launched Property Assessed Clean Energy (PACE) at a gathering of community leaders. PACE is a new and innovative option for financing energy-saving building upgrades. 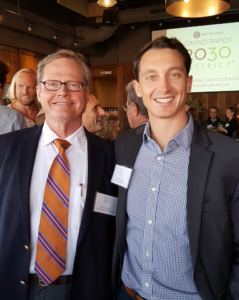 The gathering, organized by the City of Grand Rapids and Grand Rapids 2030 District, was billed as the: “City of Grand Rapids PACE Launch Celebration”. The celebration showcased Property Assessed Clean Energy in a bold way. The mayor described the program as a vital tool for helping the city achieve its sustainability goals. It will also help Grand Rapids retain its unofficial title as “America’s Greenest City”. 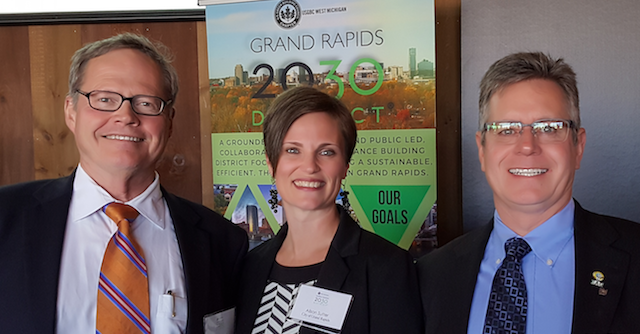 The city’s sustainability goals were exemplified when Grand Rapids became a “2030 District.” Members of 2030 districts have volunteered to achieving a 50% reduction of the energy consumption in their collective buildings by the year 2030. PACE will play a critical role in helping to achieve these goals by providing 100% long-term financing at fixed interest rates for building efficiency and water conservation improvements, as well as renewable energy projects. The financing results in a special property tax assessment similar to those used to fund sidewalks, streets, sewers and other community improvements. Many of these projects would never get off the drawing board using traditional funding options. Mayor Bliss introduced Alison Sutter who will oversee the PACE program in her role as the city’s new sustainability manager. Sutter described the basics of getting a PACE project started in Grand Rapids, and also announced a new online PORTAL that provides the easy first step for building owners to take advantage of PACE. Andy Levin of Lean and Green Michigan, the official PACE Administrator for the city, noted that in addition to PACE helping to save energy and reduce waste, it also drives local economic development without using taxpayer funding. PACE projects put architects, engineers and contractors to work on commercial, industrial, multi-family and non-profit buildings using private sources of capital. There is a growing need for building efficiency upgrades. The average U.S. building is over 50 years old and wastes 30% of consumed energy. PACE upgrades help reduce waste through improved lighting, energy efficient heating and air conditioning, high-efficiency appliances, renewable and alternative energy sources such as solar and geothermal, and building envelope improvements. In addition to saving energy, PACE upgrades frequently result in increased worker productivity by providing more comfortable working environments. The Energy Alliance Group of Michigan was a co-sponsor of the mayor’s event along with CleanFund Commercial PACE Capital. As a sponsor it was encouraging for the organization to witness the collective enthusiasm for PACE. The EAG team had a chance to talk with a number of building owners who mentioned their need for energy efficiency improvements in the buildings they owned and how the lack of adequate financing tends to prevent or delay any action. Cheri Holman of the Grand Rapids 2030 District noted the organization is “a public / private partnership that is working together to reduce energy, water, and transport use in our urban core. More than 10 million square feet of building space has already been dedicated to this effort to improve our environmental impact, to strengthen our community’s vibrancy, and to increase the marketability and profitability for our property owners and developers.” Holman noted that PACE is a tool that will help the organization meet their aggressive goals by the 2030 deadline. Congratulations to Mayor Bliss on a successful launch of Property Assessed Clean Energy and for recognizing the key role it will play in the “greening” of Grand Rapids.